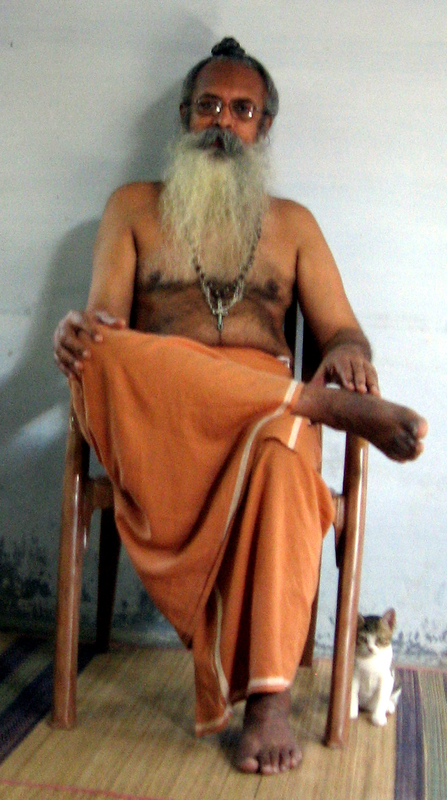 Am a 67 year old catholic Priest, living as a Sannyasi. I Consider that Love, Joy and Peace are the Most Important things in our life. I Trust and Pray these posts will help You Experience the Same. Thought of adding this photograph here. Gives You an Idea of Silly Old Me! Am Very Happy that Elali, our Cat, had turned up by herself for the photo-shoot! Photo from 2011. On the One side, I have written that I give You ‘Workable Ideas.’ On the Other, I have named my site on Three subjects, Love, Happiness and Peace. I want to write as to HOW We can Achieve an Abundance of these in our Lives. Yet, Other than having written a few posts on ‘Love,’ You find me writing So much on Current Affairs. This, my Dear Folks, is Not due to any Lack of Ideas. I hope I get the time to apply myself to the main topics soon. LOVE DEMANDS that We Jump into the Fray in Aid of the Needy. PEACE is Achieved Only If We Do the Needful. After all, Peace is Not going into a Cocoon. And HAPPINESS Comes in Knowing that We have done Something Useful, and have Contributed to the Scheme of things, etc. The Situation seems to Demand Different View points on Life. That the Truth be told, which the ungodly are trying their hardest to bury under a barrage of words. It is Necessary, after all, that We keep Correcting the state of affairs. ABOUT MY STYLE OF WRITING! The Style, by Itself, must be Apparent. But You would find a few things different in my Blog. I Capitalize Quite a Lot of Words! This is Intentional. I hope to Achieve a ‘Spoken, Speech sort of Effect’ through these. Now Over to YOU! Tell me about YOURSELF, and Just What YOU think of my Efforts. Love and Blessings. Updated: March the 1st, 2015. Thanks, Herman! All the Best. Love, Joy and Peace, these are indeed life’s truest riches. When I was younger, I had a wrong perception of riches. Events through the years made me realize that all the material things like a big house, a car and expensive things are all fleeting and goes away in an instant. In the end, faith, family and true friendship are the keys to having a happiness that last a lifetime. God bless. Thank You, Brother! Your thoughts and Your support Appreciated, very much! Thank You, Dilip! Loka Samastha Sukhino Bhavantu! Beautiful mantra Swami Yesu let Peace and harmony prevail in every soul! I am a cyber wanderer when I entered your beautiful mansion. It is lovely to have met a great writer. May the Lord’s blessings showered unto you. Had gone to Your page/site. Looks great! But, as I wrote on Your twitter, I never dare to go into videos as my net is too slow, and it becomes too expensive. …Seems to comment on Your site, have to fill in so many areas! Can You make it simpler? Love and Regards. Thank you for your kind message/comment, Swami. I’m sorry you’ve problems in my other site. This is the one I use for this community, jdonn.wordpress.com. Thank you again, sir. We are following each other on Twitter. 🙂 Blessings. Greetings! I found you on Paul Militaur’s blog…and decided to see what you had to say…I am with you on the Capital Letters! LOL I do the same! I am going to on to read your postings now. We need love, happiness and peace in ourselves and in the world…I am working on it in myself. I started to read Thich Nhat Hahn’s teachings…and I liked his book on “Mindfulness” so much, that I went to the mediation practice for a year…then circumstances would not allow me to continue the group meditation–but I still practice on my own. I find it beautiful and so enhancing to my life! Namaste! Thank You, John, for Your read and the comment! As You say, We all need Love, Happiness and Peace. Regards. Hey there! Just happened across your blog and decided to give you a follow. If you like, check out my blog at http://www.thatssojacob.wordpress.com. Have a great day! I love your blog. it’s so insightful and I’m glad you have it! I love your capitalization strategy in your writing because everything “sounds”/seems so boldly exciting and important!! Keep up the great work and I can’t wait to read more of your posts!!! Dear Baba, I wanted to write you an email. Would that be OK? If you don’t want to display your email publicly, here is my email address so you can send your contact: artbella9@gmail.com THANK YOU! Thank You, my Dear. Shall contact You. I do not like to use e-mail so much because Facebook chat, etc, make it so much easier to contact people live, and keep up the conversation, at the same time remaining private! See if You would not prefer that. Pl give a search for – Towards a Better World – in Facebook. It would have my photograph, the same as for the blog. Do respond. Thanks and love. Thank You, my Dear Nomzi! Regards. And this is why I love blogging! How often do you get to meet a 67 year old catholic Priest, living as a Sannyasi, with a kitten by his side? I see you have met Nomzi too! From Your: ‘Introduce Yourself’ post, just HOW do We say Hi? Could You help me in this please? Like it! 😉 Eedee it is! Thank you for the follow, Swami. The depth of your faith is humbling for me. God bless and protect you. Thank-you so very much for visiting my blog and for the follow. I am honoured and grateful. I have enjoyed reading your posts this afternoon and will be returning to read more. Dear Swami, I’m so happy to meet a Catholic priest on the blog. I am a Catholic, baptized at 17. Now I’m 79. Besides my disability with my left hand and left foot, three stent added to my heart April 2014. I believe I am in God’s hands. Our good Lord will take care of every thing. He even arranged me to meet a lovely priest on blog. My Dear Myra, So Happy to meet You. Good to know anybody and everybody, of course, but a Fellow Disciple is a Bonus. Keep me in your prayer, please! May I call you Fr, Swami? Shall pray for You, for Sure, my Dear Myra. So sorry! Swami, I just saw you comments today, Please forgive me! These days I’ve had some hard days, Please keeping on pray for me. Thanks for liking my comment on governments as opposed to companies on another site. I think you might have been the only person who understood the distinction. I am glad I popped over to meet you on your site. Love the photo of you and your photobombing cat. You’ve Bean Tagged: http://cafebookbean.com/youve-bean-tagged/ Season’s Greadings! Wonderful site you’ve created, Swami Yesudas! Thank You, my Dear Anita! That is very kind and thoughtful of You, to take and make time to write in two languages. My Dear Jennie, Thank You Very much for that. Much Appreciated. Went to the link, and see that it is Too much work. I am too hard pressed for time. I totally understand. Just want you to know how much I enjoy your blog. Me and my family belongs to Couples for Christ. I’m happy to see your blog here and keep spreading love, happiness and peace! My Dear Aui, You may be Sure that even in India, Very few catholic priests either look or live like me!!! Glad that You are an Active Christian. Blessings. Thank You. Very kind of You. …That Kitten was very fond of me, and had just come and sat there ‘by itself,’ at just the right place, the right angle, and all that! She became a Grand mother, and very sadly, died of food poisoning, [ Most of Indian kittens roam free. This one had eaten the fish in our canal as it was drying ]. But in my Arms. I had taken her to the vet, but she could not be saved. Frankly, I cried quite a good deal. Yes, We Do, don’t we? …Regards. Hello Swami I enjoyed reading about you. I agree with your explanation about LOVE, PEACE AND HAPPINESS. Regards Ally. Your comment on one of my comments brought me searching. I’m also a Catholic – before that I was a Buddhist, and before that a Hindu. And before that, I was not born yet. I think. The gods became fed-up with my antics and sent me to earth. I planned my life before coming down here. Along the way, I forgot my plans. I’ve been searching for my mission in life. At age 63 and partially bald, I remain confident that at least after the end, I’ll discover my plan. By the way, “Oh god” – that’s what my mother said, when she first saw me. I’m yet to figure out what she meant. She is not into using uppercase letters. She was not into the “Spoken, Speech sort of Effect”. In my case, I’ve no effect at all.